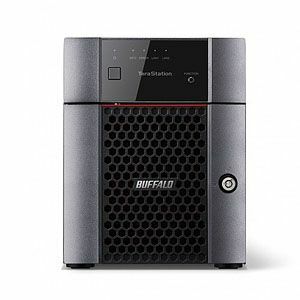 The Buffalo TeraStation 3410DN NAS Server is a high-performance scalable storage solution for businesses that need capacity, performance and support for growth. It is powered by 1.4GHz Annapurna Labs AL212 Dual-Core processor combined with a 1GB DDR3 RAM memory that provides a smooth performance while managing multiple request simultaneously. It has four hot-swappable bays to effectively manage data storage being populated with 4x 1TB SATA 6Gb/s HDD with a built-in RAID for data redundancy and performance improvement. Supporting RAID 0, 1, 5, 6, and 10 for added performance or data mirroring options. It features two Gigabit Ethernet rj-45 ports and USB 3.0 interface that allows easy connectivity and cloud backup/data recovery capabilities. With 85 watts power supply it provides enough power to run demanding applications. Buy Buffalo TeraStation 3410DN 4Bay 4TB NAS Serverr now!